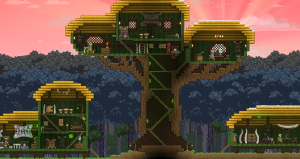 A Floran treetop village dwelling. Floran Treetop Villages are a Floran style village made up of houses built in high trees. The homes are usually made out of bamboo, with thatch roofs. They're often decorated with bones and animal hides. An early village, they've been available in game since beta was released. These villages can be found on any planet type aside from moons, any ocean worlds (including magma, arctic, and toxic), or garden planets. They are most likely to appear on forest planets over any other planet type. Basic treasure can be found in most containers while valuable treasure is in themed chests. Valuable treasure chests also contain Raw Steak and at higher rates. Bamboo Block 0 Freshly cut stalks of bamboo. Bamboo Door Door 95 This door is strong and sustainably sourced. Cobblestone Block 0 Hard cobblestones, smooth to the touch. Large Primitive Cabinet Storage 130 A cabinet adorned with huge, sharp fangs. Large Snowy Pelt Decorative 160 The pelt of a large, snow dwelling animal. Leather Dressing Screen Decorative 120 A leather screen, used in Floran food preparation. Primitive Desk Furniture 100 A desk, probably belonging to the greenfinger of a Floran tribe. Primitive Leaf Painting Decorative 55 It appears to be a painting of a falling leaf. Primitive Shelf Decorative 90 A wood and bone shelf used for storing supplies and keepsakes. Primitive Table Furniture 85 Floran come together at tables like these to eat flesh stew. Primitive Toilet Furniture 75 This toilet doesn't look very leak-proof. Small Bone Chimes Decorative 55 A string of bones to hang from the ceiling, like a morbid wind chime. Small Bongo Decorative 75 A bongo drum fashioned out of leather and wood. Small Primitive Chest Storage 70 A small chest, made from sticks. Its security is questionable. Treated Wood Block 0 Carefully treated wood that maintains a freshly chopped appearance. Unrefined Wood Block 0 Rough and unrefined, this wood looks freshly chopped.